Sofas – we slouch, we lie down, we curl up, we sink into them. One of the most important pieces in the house, your couch, as important as your bed, takes you through lazy afternoons, a great game of soccer, that never-ending drama series, or a special movie date-night. No matter how specific and particular your reasoning may be, like Sheldon from The Big Bang Theory, there will always be that one particular spot that will be just perfect. 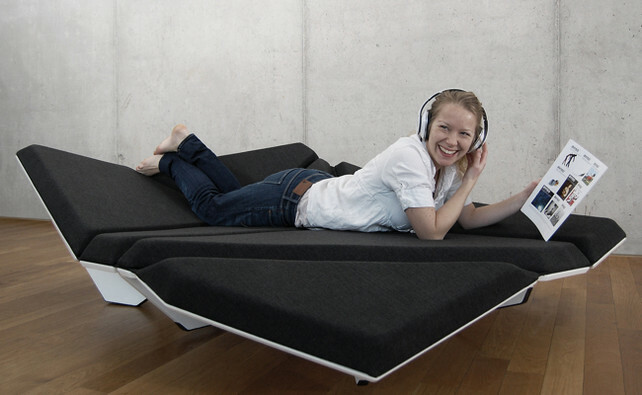 Specially designed like a giant origami, the shapeshifting sofa allows you to do all that, while looking like a piece of art standing in your living room. Swiss designer Alexander Rehn created the Cay Sofa concept to not only accommodate the various postures we assume, but to anticipate them. While the couch appears to be fixed in one position, it forms and folds, or in better terms – shift to provide support like the folds of an origami. This unconventional piece certainly makes a great conversation starter, but what it does best, is to guide you to your ‘ideal spot’.